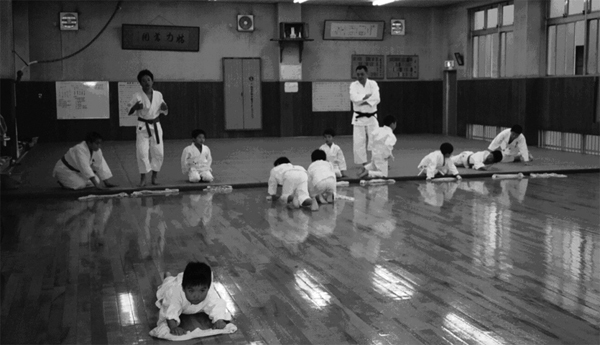 Children of the Imazu Dojo judo school cleaning the dojo. 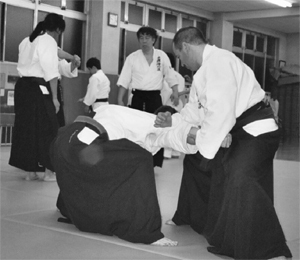 Values that are important in traditional koryu can be transmitted in gendai budo. After a few years of practice, and having lived for some time in Japan, I have to admit that there were times that I wondered if training in the art was not the essence, rather than the art itself. And then I think I was lucky to have had several years of karate experience and to have gained at least some understanding of the budo mentality. How frustrating it must be for a Westerner with no background in martial arts to try to grasp a koryu, a combat tradition that is so embedded in Japanese culture. Now, so many years later, I still believe I am condemned to train forever, although I begin to realize that somewhere at the end of the road, a better understanding might be possible. Since the process of training is so important, I would like to discuss it a little further. in the sohombu dojo in Nishinomiya. The term training does not describe very well the combination of practicing, learning, training, searching, and even questioning, that characterizes the process in a koryu. In Japanese, this is so much better described by the word keiko. Keiko refers to the teachings of the old masters. Their skills have been passed from generation to generation. We have to rely on our own search but we are fortunate to have the guidance of our teachers. Because of this inherent relationship with our teachers and therefore indirectly the old masters, I can illustrate how--even today--some of the old teachings survive with a few examples from Hontai yoshin-ryu. In part one, I have already referred to the first two soke and how they incorporated the philosophy of the school into the name. We also know that the third successor, Takagi Gennoshin Hideshige, served the Himeji-han, and was paid the unusually high salary of five hundred koku as a bugei expert. This well respected teacher has influenced the school significantly. From the early teachers, the words of the 14th soke, Ishiya Takeo Masatsugu, known as the master of masters in the Edo period, are probably the best conserved in our school: "One: eyes; Two: speed; Three: courage; Four: power," and "Soft on the surface, strong inside." The teachers of our teachers are referred to all the time and sometimes we get the impression that we know them personally because their example is being kept alive in the school. The best example of this is the 17th soke, Minaki Saburo Masanori, who must have been an exceptional teacher. He said to his students: "Budo (martial arts) is philosophy, and is the art of creation," and "Budo is art. Without the heart of Buddha, there is no budo," and finally: "Do not lose the path to sincerity." We should also not forget the 18th soke, Inoue Tsuyoshi Munetoshi, who helped us to put budo in an actual context with his words: "The root of modern budo is traditional budo. Without traditional budo, the modern styles would not have been possible," and "Budo is the way of peace. With this attitude, budo is useful for the development of the youth in the world." Although I have spent much time with his father, my true teacher is Inoue Kyoichi (now Inoue Kyoichi Munenori, 19th generation soke and direct student of Minaki); I consider him to be a technical genius. Over the years, he has referred so many times with enormous respect and admiration to his own teachers that I sometimes believe that they must have been true gods. I now understand I will never reach that status, but if I want to adhere to the real budo spirit, then I should make it my absolute purpose in life to come as close as possible, be it with all my limitations. I wonder if, as a Westerner, I will ever achieve this state of mind. metaphor of progress by the current soke. Another aspect that is important when discussing training, is the process one has to go through, not just technically but also mentally. According to Donn Draeger (in his book Classical Budo), there are four different stages in training, similar to the progress in Zen Buddhism. Gyo is the first stage, in which training is done through repetition and hard labor; little in-depth explanation is given. Shugyo is the next stage in which the trainee is confronted with situations that are difficult and where a solution has to be found through discipline, courage, and correct application of what has been learnt. Jutsu is the stage where techniques become art. Do is the final stage where the way is found. Although these stages are not formalized as such in Hontai Yoshin-ryu, a clear training progression is recognized. 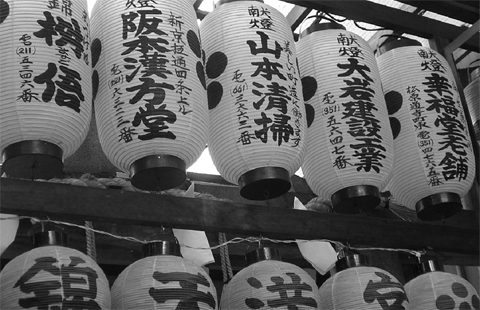 Inoue Kyoichi Munenori (the 19th soke) compares progress in the art with a Japanese lantern or chochin. At one end, at the beginning, the lantern is small,but the volume quickly gets larger. This large volume is maintained for a long time, and only at the end is it reduced again. Indeed in a koryu, it takes a long time before one can reduce the large amount of information to its bare essence. Students are called deshi, which can be translated as pupil, disciple, adherent, follower, or apprentice. Most of us will continue to consider ourselves to be deshi, even if a larger part of our time is devoted to teaching or helping less advanced students. Beginners are called shoshinsha, or more poetically monjin, literally "a person at the gate." Keiko, takes place in a dojo (lit. "the place to study the way"), a place of dignity, humility, and constant cleanliness. Indeed, an atmosphere of courtesy and respect is essential to cultivate the appropriate spirit associated with budo. During practice, movements are only performed so far as to avoid the risk of injury, which is not the same as avoiding pain. Being trained in sports medicine, I do have to admit that my logical explanation of pain as a signal of something which is going wrong, hence to be avoided, is sometimes in contrast to what we do in budo. The level of progression in budo is often reflected by a dan grade: shodan, nidan, sandan, yodan, godan, roku dan, and so on. The dan system was first introduced in budo by Kanō Jigorō (founder of modern judo). Originally it was a grading system, used in the traditional game of go. As a shodan, most budoka (person doing budo) wear a black belt and are called yudansha. This is also the case in Hontai Yoshin-ryu, where a black belt (obi) can be worn on top of the hakama. Some traditional schools have adapted the dan system in order to formalize progress. However, these schools almost always keep the traditional den system in parallel. 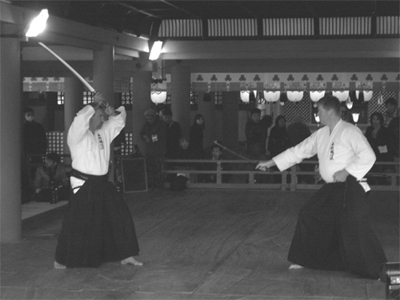 Also in Hontai Yoshin-ryu, much importance is given to the traditional form of transmission. There are the following levels: shoden (first level of teaching); chuden (middle level of teaching); okuden (secret teaching) and finally menkyo kaiden (license of complete transmission), the highest level of teaching. Few Westerners have been accepted into the den system since it is only after several years of serious training of different kata, to about a 4th dan, that the traditional levels of training become accessible. Moreover, these teachings are only given by soke at the sohombu dojo in Japan. In the traditional schools there is also a strict sempai-kohai (or senior-junior student) system, which is a typical Japanese phenomenon, but essential given the complex and dangerous nature of what we do. If the junior student does something wrong, it will be corrected by the more senior one. This also allows for dangerous things to be practiced within the system, but it also ensures correct behavior when outside the system. In budo, everyone who has trained with you but started before you is your sempai and he will have your respect, regardless of his technical competence (very often a talented student will become more skilled than his sempai). Sempai–kohai relationships should however remain healthy and are by no means a way to take advantage of beginners. Also, a sempai who has been away from training for a long time, should be humble enough not to interfere with the progress of those who have greatly surpassed him in training hours. 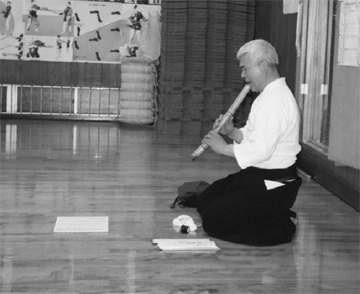 In every koryu, transmission is based on a privileged relationship between teacher (sensei) and student. Transmission is purely oral (kuden), but most of the teachings have been recorded in writing in densho. In this way new influences can be explored without fear of not been able to return to the origin. Much has been written about the meaning of soke. The word soke is originally a Chinese concept (Mandarin zongjia) with strong familial and religious connotations and its translation as grandmaster is not really accurate. Moreover, the role of soke has changed over time and most Japanese, not involved in koryu, will have a hard time explaining its meaning (see also "Soke: Historical Incarnations of a Title and its Entitlements" by William M. Bodiford). Having a soke in koryu should be seen as a guarantee for succession and preservation of the historical and cultural legacy of the school. Nevertheless, in Hontai Yoshin-ryu, soke still has absolute authority over the branch instructors and indirect authority over their students by controlling what and how the style should be taught. Since kata are very important in the transmission of old jujutsu schools, I want also to provide some thoughts on their significance in the transmission of the art. Kata are the forms that will allow the student to learn a proper technique, movement, and control of distance and timing. 19th Itsukushima Enbu Taikai (Miyajima, Japan). Kata are often described as only omote, which refers to the "front" of the true techniques (which are known as ura). Indeed, a kata contains different things that have to remain hidden inside. That is the way kata is meant to be. While discovering a kata at first, no one is supposed to understand all at once. Even more, if you can understand it right away, it is not a real kata but an undeveloped one. Even the simplest old kata contain many different things. It will take many years to understand it. The people of the past have in many battles, wars, through different experiences, trained and trained to develop these kata. That is why even only one kata has so many aspects and contains those things learned at war and in combat. Training without understanding this is meaningless. It is important to note that kata in the koryu is the only way to learn and master the dangerous techniques of a given system. Not only are the techniques to be transmitted as such, but also the combative behavior--an essential part of the art--can only be cultivated through the practice of kata. Indeed, the only alternative to a kata is a real fight. This is quite different from modern budo where rules were introduced to avoid injury and allow for free sparring, referred to as randori in judo and ju-kumite in karate. To prepare for a tournament, a modern practitioner of judo or karate gets more benefit from these free training forms and kata is often reduced to either an aesthetic set of movements or to a method that allows the study of the more spiritual aspects at a senior level. Probably the most intriguing statement made by the current soke, Inoue Kyoichi Munenori, is: "Kata is kata . . . but . . . Kata is kata." This sentence says everything about kata, but let me try to explain it. In Hontai Yoshin-ryu, you can choose do decorate the jujutsu techniques from the kata by doing them a bit differently. Strikes and kicks can be added, and to a certain extent that is the way to make a kata more complete. But, as already mentioned, in many old jujutsu schools, there are things in a kata that are kept secret. Therefore, true execution of kata will remain sober and fundamental in nature. All other forms, although interesting as exercises, are to be seen as applications and cannot be called kata. In most koryu (including Hontai Yoshin-ryu), kata are performed by two opponents: uke, the opponent who in a kata undergoes the technique, and tori, who actually performs the technique. This means that most (but not all) kata will start with an aggressive action, or attack, from uke, that will be responded to appropriately by tori. Rei by members of the sohombu dojo and 3 members (Alain, Frederic and the author) of our dojo, during 30th All Japan Traditional Martial Ways (Kobudo) Demonstrations (2007, Kumamoto). Before finishing, I would like to mention one other important feature in all koryu, namely the importance of etiquette: reishiki or reiho. The most extreme form of etiquette can be observed in those who follow the guidance of the Ogasawara family (Ogasawara-ryu reiho). Indeed, the Ogasawara were not only famous for archery and horsemanship but also for their formalization of manners. Hontai Yoshin-ryu, like every school, also has its rules, but in essence, they should not be seen as an artificial set of well polished manners, but rather a true but simple manifestation of respect, which also incorporates qualities like modesty, concern and generosity. Correct attitude should not be studied from books, but will come naturally by training in the group. The role of the sempai is very important to ensure things go the way they should. Nevertheless, books can help as reference and some time ago, I started to write down my interpretation on how to behave in the dojo from what I learned from my teachers. While doing so, I found a copy of In the Dojo by Dave Lowry and having read it, I decided not to put too much effort in the subject anymore but to recommend others to read that book as well. Another, closely related feature of many koryu is the sense of aesthetic simplicity, now sometimes expressed in such concepts as wabi sabi, a general term that refers to the aesthetic sense in Japanese art emphasizing quiet simplicity and subdued refinement. This is often already apparent in the contrast between how people dress in some modern styles compared to koryu. In Hontai Yoshin-ryu, for example, the training suit or keikogi is plain white, with a dark hakama and, apart from the name of the school written in kanji, there are no badges or any other decorations used. For those who made it to the end of this article: eagerly anticipate your next training session. To quote from the book Illuminated Spirit: "Don't be afraid of failure. See it as a learning experience that provides an opportunity for continued growth." Copyright ©2008 Guy Buyens. All rights reserved.